My new favorite writer is John Piper. This year I’ve added reading his works to my morning quiet time. While this started unintentionally, his thinking has been so rewarding, it is now intentional. Last year my mom gave me a copy of Seeing and Savoring Jesus Christ, which is an abbreviated taste of Piper at just over 100 pages. It wasn’t until I started Desiring God, the Piper classic, that I fell in love, not just with Piper, but all over in love with God and my relationship with Him. 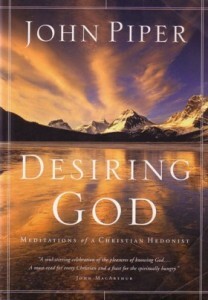 The subtitle of Desiring God is Meditations of a Christian Hedonist, and the premise is a minor twist on the Westminster Catechism that “The chief end of man is to glorify God by enjoying Him forever.” Piper’s supposition is that “the chief end” is not two things, but one thing (glorifying God) that occurs when the other happens (enjoying Him forever). 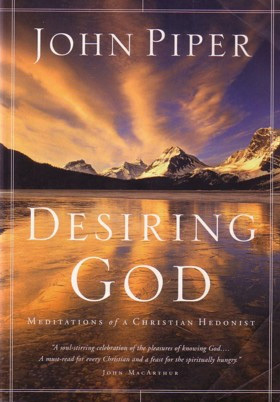 So that Christian Hedonism should be our goal in life – that is, pursuing joy, pleasure, happiness in God. Piper provides ample evidence of this truth as it is expressed in scripture and supported by other Christian writers and theologians. “Delight yourself in the Lord” and “In your presence there is fullness of joy” says the Psalmist. Jesus gives us His command “so that our joy will be complete.” Paul instructs the Philippians to “Rejoice in the Lord.” And, he quotes extensively from CS Lewis, Jonathan Edwards and other Bible scholars. What makes the book and its premise revolutionary and remarkable is that for some reason, as Piper points out, Immanuel Kant’s ideals around morality have infiltrated the Church. Kant’s idea that a good will is one that acts from duty, or “the virtue of an act diminishes to the degree you enjoy doing it and that doing something because it yields happiness is bad.” The Church has adopted this mentality of: if it is worth doing, it is going to be painful, or if you enjoy it, you have automatically reduced its worth. Before you think Piper is preaching “prosperity gospel,” he is not. He dedicates an entire chapter to suffering and the joy that is to be found when God purifies our faith during trials. There is no way to adequately frame all that Piper has to offer Desiring God, you just have to read it for yourself. This book has given me a whole new appreciation for how I experience joy and watching others experience joy – for example, watching our praise team on stage during the worship service. And, as I mentioned earlier, it has given me renewed inspiration for how I pursue God.